And Here’s Someone Who Really Wanted His Picture Taken….. Unidentified baby and dog, ca. 1900. Cabinet card photograph, 6 1/2 inches by 4 1/4 inches. H. A. Seymour, Jackson, Michigan, photographer. A few posts ago, I published a carte-de-visite of three little girls and a dog who was not enthusiastic about visiting the photographer’s studio and could be seen lurking under the studio chair. This is clearly not the case here! This is a cabinet card photo from around 1900, taken by H. A. Seymour of Jackson, Michigan. 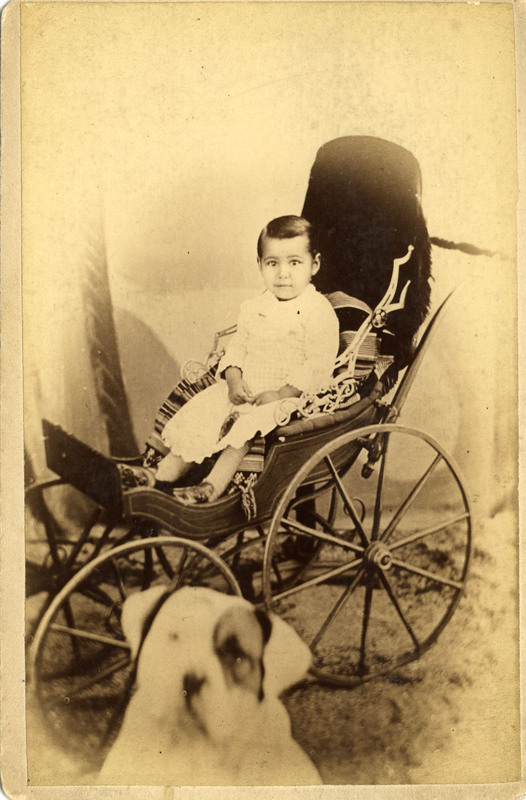 I surmise that the dog was supposed to sit beside the push carriage and decided to walk toward the camera. (This is something that my cats and dogs do all the time when I am trying to photograph them.) Or perhaps the dog was the photographer’s and simply popped into the frame just as the shutter was released. Note that he is looking directly into the camera. The fact that this image was printed and survived at all is amazing to me. We can’t know whether the parent of this baby thought that this picture was funny, but someone clearly did! I love this image. Unlike so many studio photographs, this one comes from the experiences that happen in real life. It is funny, and touching, and reminds us of how smart and curious dogs can be. I am so glad we have it.